The bugs were deep and all of us were super saturated with Nitrogen. We had to try deeper places, so the Captain pulled anchor to find a similar spot. After a 20 minute boat ride and a surface interval of over an hour, we anchored in a not so secret spot – there were several dive boats already in the area. “It’s 3:30 AM, hasn’t this spot been picked clean already?,” I thought. 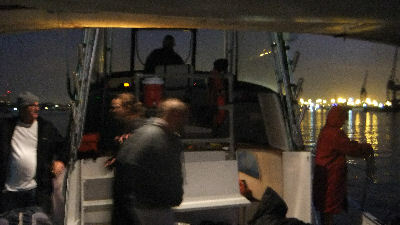 Eric made a mad dash to be the first one off the boat. I soon followed and noticed a fairly strong current. I submerged down the anchor line and swam against the current. I hit a reef with an abundance of fish and other sea life. I spotted a short lobster with half its legs gone, limping on the sand. Yeah, this place has already been raided and I bet the lobsters are spooked. I saw a bunch of bugs in the cracks of the reef – too far in to grab. I know they were too far in, because I tried; I even looked for a back entrance. This was a nice dive, with lots of structure and sea life, however we got there too late. The fact that I always saw at least one other diver’s light double confirmed my thought. I began to accept the fact that I would not be limiting on this dive. I toured around the reef, and when I lost hope for another bug, I slowly swam to the surface. I hit the surface literally 15 feet away from the boat. Eric amazingly caught two on this dive – he didn’t have to go home skunked. My entire catch for the trip. 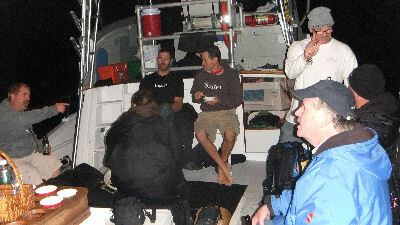 We debriefed after the dives, but I soon found myself sleeping in the galley on the way back. We made it home just as the Sun was coming up. 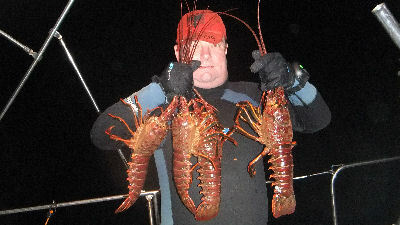 This trip was not as plentiful as last Opening Night; some experienced divers got skunked or only one or two. 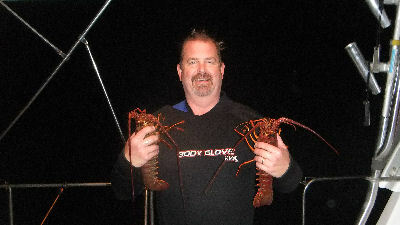 Tim was the only one who limited and won the jackpot for the biggest dive (pictured last post). I ended up with four lobsters and felt bad that I didn’t have a couple to spread the wealth around. All in all, another Opening Night with cool people on a cool boat. I don’t want to complain being that I did better than most on this trip, but I can’t help thinking that if the captain had stuck to the plan and just moved out deeper you and I would have limited and been able ot help others find bugs. That being said, I had fun with a great group of friends. Be thankful the boat at least moved, I have been on boats that did the second and third dives in the same spot. My opening night, drop off kayak, 40 min have 9 legals, 2 go back, get back on kayak, paddle in to hit Dive n Surf by 2:30 am. We got lucky this opener. But we payed the price, there was 4-6′ swell with wind chop and low surgy vis this opening night.